ExpoDev version 1.1 has been submitted for App Store approval and is waiting for release. Version 1.1 is a minor update that includes a few fixes and enhancements, most notably being that the Bellows Extension Factor calculator has been completely revamped. 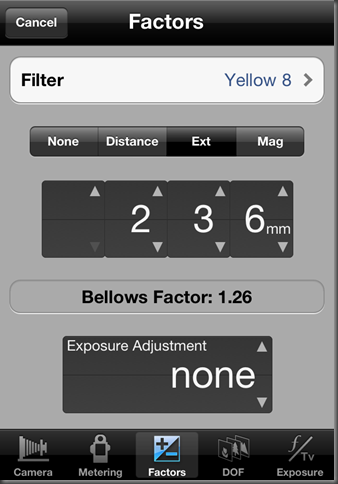 As you can see below, this new version now supports bellows extension factor compensation by using either the subject distance, the actual bellows extension, or a magnification factor. When working with subject distances you can use either meters or feet and inches, as measured from the subject to the lens board. For Extension, the actual bellows extension is measured in millimeters. Magnification is a decimal magnification factor with 1.0 being a 1:1 reproduction factor. ExpoDev will now directly tell you the calculated bellows factor and as such, ExpoDev no longer tries to determine whether a subject is a close-up or not. This leaves the photographer in charge of determining whether or not to apply a bellows factor as they see fit. ExpoDev does place some reasonable limits on factors though: if the calculated bellows factor results in less than 1/6th of a stop then no factor will be applied. 1/6th of a stop is well within the margin of error, all things considered. ExpoDev will also place a limit on the maximum factor of 65,536 (about 16 stops). In both of these cases, ExpoDev will let you know what is going on so that you, the photographer can make informed choices. A few other minor improvements are included in this release. It is now possible to use lenses up to 2000mm and the minimum aperture has been increased to f/2048 (for pinhole photographers). One key aspect of an effective DOF calculator is letting the photographer choose one very important parameter, the Circle on Confusion size (CoC). CoC values are typically expressed in millimeters. ExpoDev offers a selection of CoC values along with the suggested film format size they should be used with*. There are a lot of opinions though on what CoC values should be used for particular film formats but it’s really a matter of personal choice and greatly depends on the enlargement factor to be used when making prints from your negatives. For instance with contact printing, a larger CoC can be used since there is no enlargement factor. With smaller film formats that will be enlarged, a smaller CoC should be used. The greater the enlargement factor, the smaller the CoC value needs to be. Typically though, we don’t always think about enlargement factors while working in the field. To make things simpler (but not necessarily less flexible) ExpoDev makes one general assumption: that the larger the print size, the farther away the typical viewing distance will be. ExpoDev therefore assumes that the typical viewing distance will be roughly 1.5 times the diagonal measurement of the print size. This generally holds true for most viewers, whether it is a large print on a wall or a smaller print in their hands. This assumption allows ExpoDev to use one CoC value for each film size without making you think too much about enlargement factors. If however you want to increase the perceived sharpness of a print it is as simple as choosing a smaller CoC value in ExpoDev. This method retains the flexibility without making the user interface needlessly complex. The important take-away here is that choosing the correct CoC value is what determines final perceived print sharpness and since ExpoDev gives you that control, you can make the DOF calculator work to suit your needs. Now that we got that out of the way, we can get back to the features of ExpoDev’s Depth of Field calculator. ExpoDev has three DOF calculators. The first one, Check mode, is the simplest and can be thought of more as a DOF checker. You simply tell ExpoDev what aperture you are using and the subject distance and it will calculate the Total DOF, the Near and Far planes, and the Hyperfocal distance for you. The next DOF mode, Distance mode, allows you to tell ExpoDev the Near and Far focal planes and it will then tell you the Minimum Aperture to that can be used along with the Focal plane and total DOF. It also tells your one more important thing, the Optimal Aperture. The Optimal aperture is the concept that print sharpness is really a balance between perceived sharpness and diffraction. There is both a minimal aperture to get the perceived print sharpness you want but there is also a point at which a smaller aperture starts to degrade the sharpness due to diffraction. The Optimal aperture is the aperture which balances these two effects. It is the midpoint where you get the greatest DOF with the least amount of diffraction. You can use either aperture when making your exposure to get the DOF you need, but for optimal print sharpness you sometimes might want to go with the optimal aperture vs. the minimum aperture. The final DOF mode is called Focus Spread mode and is probably the most practical one to use as it requires no estimations or measurements of subject distances. Focus Spread mode is a way of easily focusing a view camera by measuring the distance that the focus rail has traveled between focusing on both the nearest and farthest points. If you measure and enter this distance (in mm), ExpoDev can then calculate both the minimum and optimal apertures that will make everything from the nearest point to the farthest point fall within the DOF. This makes it really easy to focus a view camera as it does not require you to stop down the lens at all until you are ready to make an exposure. You do all focusing while the lens is wide-open. The really great thing about this method is that it automatically takes into consideration any view camera movements that you are using. This makes figuring out which movements are improving the DOF as simple as measuring the changes in focus rail travel (i.e. if the distance is getting smaller, the movements are helping). You can find more information about this method here, http://www.largeformatphotography.info/how-to-focus.html in the “Procedure II” section. Once ExpoDev has calculated an aperture to use for the desired DOF, it makes using that aperture easy by automatically settings the Exposure aperture to that value (if you are using Aperture exposure mode). There is also an app setting to tell ExpoDev which aperture to use when it sets one for you, either the minimum aperture or the optimal aperture. Of course you can change the automatically selected aperture to use on the exposure tab at any time but if you do and that change negatively affects the calculated DOF (i.e. it decreases the DOF), ExpoDev will warn you when you are doing so. That about covers the DOF calculator in ExpoDev for iOS. It is a significant improvement over the older Palm version of ExpoDev in many ways. It is quite powerful and flexible yet remains as easy to use as ever. * Right now ExpoDev offers a few commonly used CoC values for different film formats. In the next version, ExpoDev will let you create your own set of CoC values to choose from much like it does for filters and lenses. ExpoDev is very unique in that is uses highly accurate and test-produced reciprocity data for over 90 film and developer combinations. Phil Davis did the work of testing each and every film developer combination using selected exposure times up to 1,000 seconds or roughly 16 minutes. He also field-tested these results to ensure their accuracy. This is far above and much more specific than the data that film manufacturers publish for their films and developers, not to mention that ExpoDev's reciprocity data covers film and developer combinations across different manufacturers. Correction is not a one-size-fits-all curve; it is very unique to each film and developer combination. What is meant by "selected exposure times" though. What this means is, when you tell ExpoDev that the shutter time you want to use is anywhere within the range of 1 to 1,000 seconds, ExpoDev would then apply reciprocity failure correct and give you a corrected exposure time to use. This corrected exposure time may be a small adjustment for a selected exposure time of a few seconds or it may be several hours for a selected exposure time of 16 minutes (from 1 to 8 hours, depending on which film and developer combination you use). There is a second part to reciprocity failure correction though and that is that the overall resulting negative density also changes with extended exposure times. Unlike exposure times negative density can change either direction, either increasing or decreasing depending on the film and developer combination used. ExpoDev's reciprocity data for these film and developer combinations includes how development time should be adjusted as well. This reciprocity data is used to apply an adjustment to the Average Gradient that is calculated as part of the exposure. It is this Average G value that is used to look up the development time that should be used to produce a negative that matches the target density desired (so that printing or scanning remains consistent and easy across all of your negatives). Each Film Profile that you import into ExpoDev contains a two-part code expressed as a letter/number combination (e.g. D4, A6, etc…), The first part is for the exposure time adjustment code and the second part is the development adjustment code. For the exposure time adjustments there are 5 codes, A-E; for development adjustments, there are 7 codes, 1-7. When you export film test data from Plotter for Windows you select which code to use for that film/developer combination (Plotter has a table for all the film and developer combinations that were tested). Since you get to choose the code to use when you export your film test profile this also means that you can override the codes if your working processes need adjustments. You can even choose to export without any codes at all which will cause ExpoDev to skip reciprocity adjustment altogether. In the next article I'll cover ExpoDev's adjustable Depth of Field calculator. Until then I'm happy to say that ExpoDev version 1.0 has reached the final testing stages and if all goes well, it should be available in the Apple iTunes App Store very soon.